International Open Access week took place from October 22 to 28th 2018 with the theme of the week being ‘designing equitable foundations for open knowledge’. To celebrate Open Access week and introduce the principles of Open Data a one day interactive workshop on ‘Discovering open data in health’ was organised by Laura Rooney Ferris, Systems Librarian in HSE east and held on October 25th 2018 in the F2 centre Dublin 8. 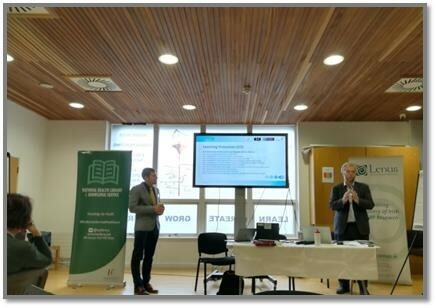 The workshop was delivered by Niall Ó Brolcháin and Lukasz Porwol licensed Open Data Institute trainers based in the eGov Centre of the Insight Centre for Data Analytics at NUI Galway. The aim of the training was to upskill participants on discovering and using Open Data and to examine the impact and increasing importance of Open Data in the Health Sector. Participants were introduced to key concepts in Open Data interrogation such as copyright, licensing, measurement of openness and processes toward making data openly available. The Open Data Portal was used throughout the day with participants locating and working with datasets available there. Practical hands-on exercises were conducted to using the portal to interrogate available datasets and examine usability, compatibility and potential errors. The portal was presented as an exemplar source for Irish open public data and an example of the benefits of making public data discoverable, accessible, interoperable and reusable. Participants were given the opportunity to discuss and apply the Open Data Technical Framework and rate datasets against 5-star scheme for Open Data. A follow up feedback survey was sent to participants after the event and 85.71% strongly agreed that the trainers gave clear explanation of all relevant concepts examined and 85.71% would be interested in further training on the subject.